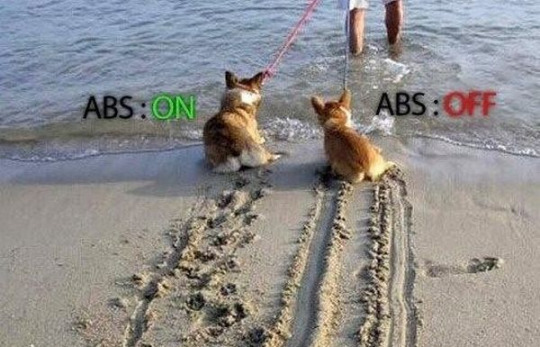 The anti-lock braking system (ABS working) is one of the most discussed yet misunderstood pieces of technology. Here are some things you need to know about it. ABS have got a number of self-declared full forms such as Alternating breaking system. Anti Skid braking system or Anti-lock braking system. The basic misunderstanding people have is that ABS works as a typical machine which breaks the vehicle alternately, which is a misconception. ABS working enhances vehicle control. It prevents the wheels from locking up and hence avoids uncontrolled skidding of the vehicle. Initial versions of ABS used to Avoid the locking of breaks on the drums. However, the newer versions not only avoid that but also, in addition, they can even break each individual tyre as per need and traction control of the vehicle. Additional feature to ABS is called EBD. ABS feature is controlled by an Electronic controlled unit that also controls your car fancy things. ECU is basically a car computer and decides what action to take in which situation as per driver demands. ABS also contain a wheel speed sensor at each wheel to monitor what speed the each wheel is rotating. ABS also linked to car braking system – a complete hydraulic unit that brings in brake pressure on the brake drum or brake pads. The most important fact is ABS works in the only panic braking situation. ECU constantly monitors the rotations per minute or and the rotational speed of the wheels. When the driver intends to stop the vehicle and press the brake pedal, ECU checks the wheel speed and the vehicle speed. Now, if the wheel is running slow significantly than the vehicle speed ( locked wheels), the ABS modulator gets a signal from ECU to release the brake pressure. At this point, vehicle and wheel speed again matches then ECU understand that vehicle is not stopping. Then it again applies brake pressure from the ABS modulator. This process repeats till vehicle comes to a halt. This is monitored multiple times every second and hence cars equipped with ABS stand no chance to lock down in extreme conditions. ABS system was first designed for aircraft in 1929 by a French automobile and aircraft pioneer Gabriel Voisin .The invention of ABS let Aircraft pilots to Apply full pressure while landing Instead of slowly increasing pressure in order to find and avoid the skid point. ABS not only enhances the landing quality but also managed to eliminate the loss of burned/ burst tyres. This proved to be of great profits to the aircraft companies. In the early 50’s-60, a Royal Enfield Super Meteor motorcycle was used by the road research laboratory to test the new Maxaret anti-lock brakes. The experiment proved ABS to be of great advantage to motorcycles. Not only it avoided skidding, but it also reduced stopping distances. It avoided the burning of tyres, it reduced the number of accidents remarkably. ABS even resulted in giving breaks a long life. However, the system was not brought into production as it proved expensive and unreliable. Almost all car companies these days offer an ABS equipped variant in the vehicle range. Most of the motorcycles also offer ABS system as standard or an option. KTM Duke 390, Honda CBR 250, TVS Apache RTR 180 are few motorcycles in the Indian market that come equipped with ABS. Read more about ABS working here. Why key-less car locking systems are pathetic and boring in a way. Importance Of Having The Right Tyre Pressure.